It has now been almost fifty years since linguistic experts began studying Black English as a legitimate speech variety, arguing to the public that it is different from Standard English, not a degradation of it. Yet false assumptions and controversies still swirl around what it means to speak and sound “black.” In his first book devoted solely to the form, structure, and development of Black English, John McWhorter clearly explains its fundamentals and rich history while carefully examining the cultural, educational, and political issues that have undermined recognition of this transformative, empowering dialect. 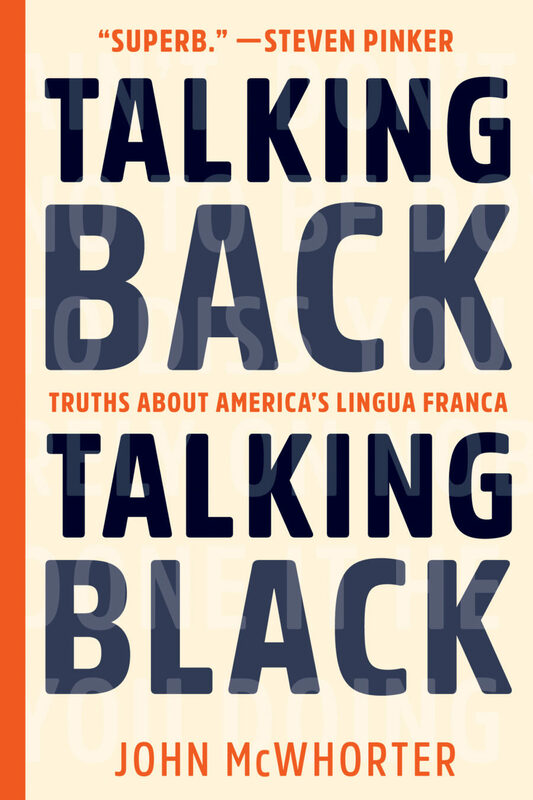 Talking Back, Talking Black takes us on a fascinating tour of a nuanced and complex language that has moved beyond America’s borders to become a dynamic force for today’s youth culture around the world. John McWhorter talks about Talking Back, Talking Black in the Talks at Google series and on C-SPAN’s Book TV, WNYC’s All Things Considered, Tablet magazine’s Unorthodox podcast, Slate’s Lexicon Valley podcast, and the Mixed Experience podcast. He also discusses the book in the Heleo Conversations series and with Columbia Magazine, Columbia College Today, and Literary Ashland.